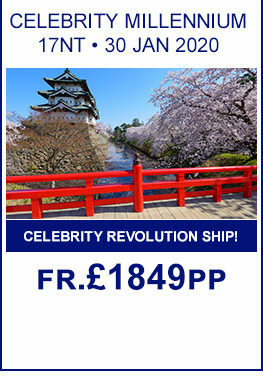 Take a cruise to Asia and immerse yourself in some of the world’s unique culture. 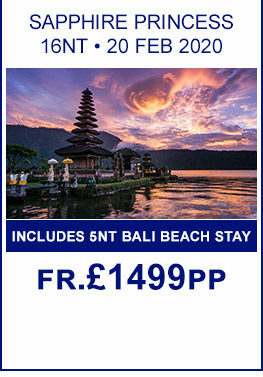 Take a tour through ancient history, temples and palaces of China, Vietnam and Cambodia to the emerald waters, white sands and sunshine of the myriad of Islands and coastal resorts, the hills and mountains to the thriving cities of modern skyscrapers. Asia is truly diversified. 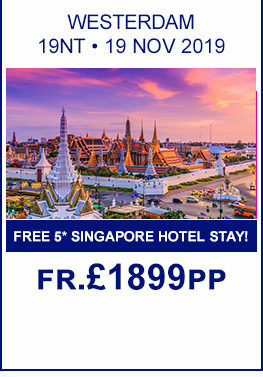 With the option to extend for a city break in Hong Kong, Singapore or Shanghai, or escape to the tranquil beach resorts of Thailand and Malaysia, you are sure to have loads of fun. And if you need more adventure, why not attend the Formula One Grand Prix in September in Singapore! Whatever rocks your boat, Cruise1st is here to help you design the holiday of a lifetime! Thailand and Malaysia with Singapore Stay. Free Upgrade from Oceanview to Balcony Stateroom! 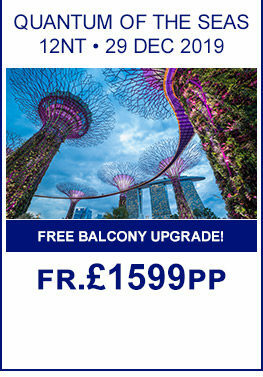 , Includes Singapore City Tour! Includes F1 GP Race Day Tix!